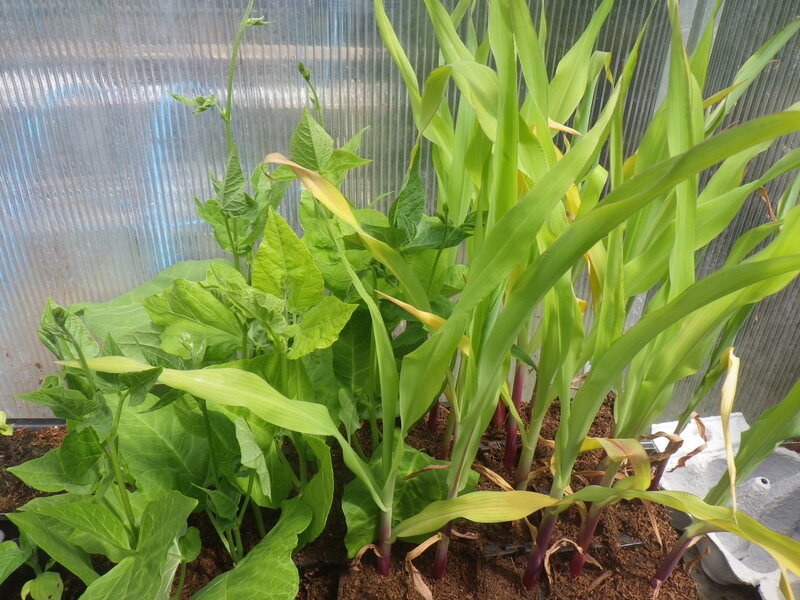 There is a planting scheme known as the three sisters; it comprises corn, squash and beans. I tried it out last year in my Waste of Space plot, but the weather was so disastrous that I had little success. 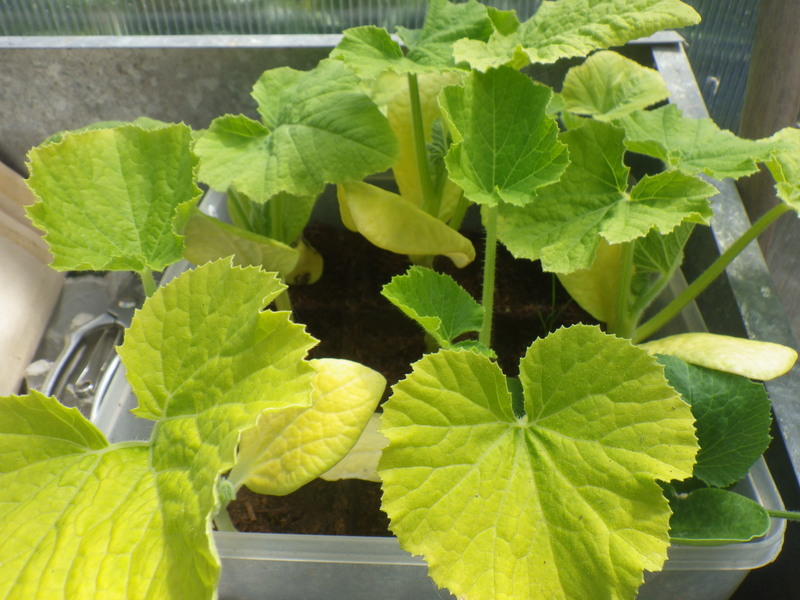 This year, however, I am going to try again, but in my rubbish bed – a location where squash cultivation has been particularly successful in the past. The rubbish bed has been added to over the winter and spring: cardboard, shredded paper, grass clippings, chicken bedding, wood ash and spent compost from last year’s pots in the greenhouse. The chickens have given it a good stir up and added a bit of extra fertility and so it’s ready to be planted. The idea behind the combination of the three species is that they use different resources and support each other. So, for example, the beans add nitrogen to the system which can be used by the other two species; and the squashes cover the ground, thus shading roots, reducing evaporation from the soil and suppressing weeds. In theory, the corn should provide a physical support for the beans, but I am going to use bean poles in case the pace of corn growth does not match that of the beans. This guild of plants, as permaculturists call it (guild means something else to ecologists) seems to be particularly adapted to North American conditions, so a little tweaking is required to suit west Wales. First, I’m growing Flint Corn rather than Sweet Corn. This corn originates from Carol Deppe in Washington State… a place much more like west Wales in terms of rainfall and light levels than much of the US. It isn’t as sweet as sweet corn, but you can use it to make things like polenta, so it seems like it’s worth a go. My beans are runner beans rather than pole beans, but these do well (usually) in west Wales, so I’m sticking to what I know. And, finally, I’m using courgettes and squashes that I know to be successful in my garden. I have to confess that, in the past, I have had limited success with this sort of polyculture planting of annuals. My perennials in the fruit cage seem to do well, but last year’s salad leaves did not seem any more productive than if I have planted them in the usual way rather than completely intermixed… but it was such a tough growing year that I have no idea whether this is really true*. Anyway, I’m going to give this mixed bed a go and see how productive it is. At least this year, thanks to the new segregation of vegetables and hens, I won’t be fighting to keep chickens out of the beans. And today I also want to mention a brilliant local project that I am supporting: a buffalo dairy. After failing to raise enough funds via a crowd funding website, our small local buffalo farm have launched an appeal for funds via their blog… they have great incentives and I’m certainly looking forward to raw buffalo milk mozzarella from just up the road. Check out the rewards they are offering… there are some attractive offers, and it’s a cost-effective investment if you like this sort of cheese (lactase enzyme at the ready for me!). * Note to self: actually collect some data on yields this year! The bed is near to a willow hedge at one end… perhaps I will be able to train some of the beans into that via some poles! The very best of luck to you and I hope you have a successful crop. Fingers crossed the weather is better than last year! I was going to try that very thing later this year when it warms up. I have a long veg bed that last year grew squash at a frightening rate (lots of pig poo in there) and I wanted to see if the corn-squash-beans method worked there when I knew at least one of them would grow very happily. Well, let’s hope for success all round! Hello! thank you for a very interesting read. I’m dying to try growing in this way when I have a proper garden! Happy eating! Glad you enjoyed the post and sorry for not replying sooner – we’ve been away for a couple of weeks and have returned to a garden full vigorous potatoes but sluggish beans, squashes and corn… still, the weather forecast is good, so we’re hoping they will do lots of growing in the next few weeks!